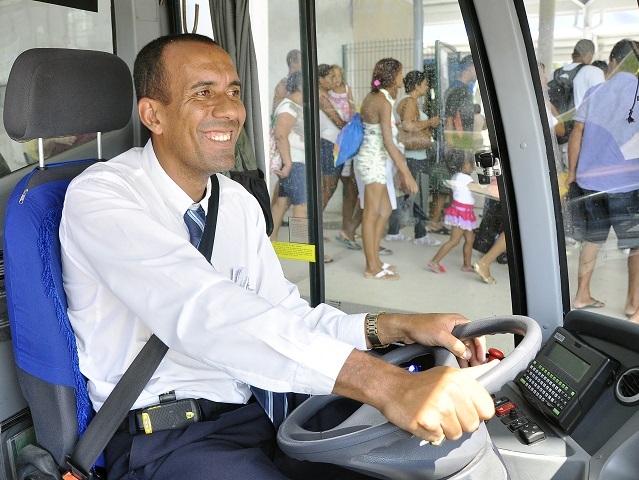 Every day, nearly 30.9 million people ride a Bus Rapid Transit (BRT) or busways system globally. BRTdata.org is the most comprehensive public database of BRT systems around the world, which recently launched new visualization tools. Photo by Mariana Gil/EMBARQ Brazil. Every single day, nearly 30.9 million people ride Bus Rapid Transit (BRT) or busways system globally. That’s more people than the entire population of Ghana or the state of Texas. 19.5 million (63.3%) of these passengers are located in Latin America, 8.2 million (26.4%) in Asia, and 1.7 million (5.6%) in Europe. Maybe you’re one of them, or maybe your city will be next to join the ranks of 168 cities located on every major continent that already have BRT bus corridors or busways. If you’re wondering how I know all this, look no farther than BRTdata.org. Although it’s been a leading resource on global BRT data for experts and decision-makers in public investment since its launch in April 2012, BRTdata.org recently debuted new visualization tools. This makeover comes just in time for a rapid scaling up of BRT systems – BRT is one of the fastest growing public transport systems, and there are already over 300 BRTs and busways corridors worldwide. The updated BRTdata.org boasts a bold new visualization scheme and a wide array of indicators broken down by sector, which reinforce this unique global platform as a forerunner in providing BRT data. The previous version of BRTdata.org used a system of graduated circles to represent daily demand. Although the circles were useful in comparing use of BRTs between various continents, their size was static – they would not change in size as data changed. For example, if demand grew in Latin America, the circle representing Latin America’s demand would not have grown. The new visualization of BRTdata.org now employs a color gradient to represent demand per continent. As you can see on BRTdata.org’s home page, continents are now entirely filled in by a shade of blue – the lighter the blue, the less demand that continent’s BRT systems have, and the darker the blue, the greater demand that continent’s BRTs have. These shades are flexible, so as data changes they too will change to accurately represent the demand of each continent. It’s a simple change, but the new visualization makes BRTdata.org incredibly user-friendly and easy to understand. Go on, give it a try! Another user-friendly upgrade included in BRTdata.org’s new look is the categorization of indicators – which range from average age to brand and logo, from fuel economy to position of bus doors, and much more. Previously, the indicators were only alphabetized, meaning that you had to know exactly what you were looking for. Now, with the indicators broken down by key aggregates, users can easily browse by theme for indicators that might be relevant to their work or interests. The information on BRTdata.org is updated monthly, ensuring that the site’s data is as current as possible. BRTdata.org is the result of a collaboration between four global organizations: Across Latitudes and Cultures – Bus Rapid Transit Centre of Excellence (ALC-BRT CoE), EMBARQ, the sustainable transport and urban planning program of the World Resources Institute (and producer of TheCityFix), The Latin American Association of Integrated Systems and BRT (SIBRT), and the International Energy Agency (IEA). These founders are dedicated to upholding BRTdata.org’s standing as the most comprehensive, public database of BRT systems around the world, and in order to do so, planning has already begun for the website’s next update. Several universities have also partnered with the BRTdata.org project, including Pontificia Universidad Católica de Chile, Massachusetts Institute of Technology (MIT), Instituto Superior Técnico Lisboa, and The University of Sydney. Where will the next BRT pop up? The answer to that question remains to be seen, but every month new BRT systems are launched or expanded – improving the quality of life for thousands of urban residents worldwide. For example, Haifa, Israel recently implemented a BRT system called The Metronit, which measures 40 kilometers (25 miles) long and has three trunk lines serving multiples cities in the metropolitan region of Haifa. Take a few minutes and check out BRTdata.org’s new features today. You may also enjoy this visualization of BRT and busways systems around the world. After all, you just might find yourself riding a BRT sooner than you think, and help influence city leaders around the world to develop better urban transport for all.